The Photo Library of INASA originated in 1918, when the Reale Istituto d'Archeologia e Storia dell'Arte was funded. A nucleus of about 15,000 prints made by the Gabinetto Fotografico Nazionale was initially provided by the Direzione Generale delle Antichità e Belle Arti of the Italian Ministry of Education. 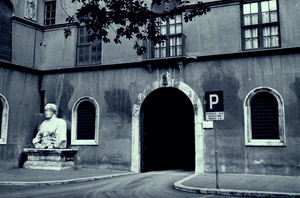 The Photo Library is located in the historic building of Palazzo Venezia, with entrance at no. 49, Piazza San Marco. It can be accessed during opening hours: Monday, Tuesday, Wednesday, Friday 9.30 - 14; Thursday 9.30 - 18. Photographs are divided in Collections, which are named after their donors; within each Collection, sorting is organized by toponyms. At present there are about 2,900 toponyms, corresponding to as many localities, of which about 60% in Italy.